Compare the interpretation of two film versions of Shakespeare's 'Romeo and Juliet.' 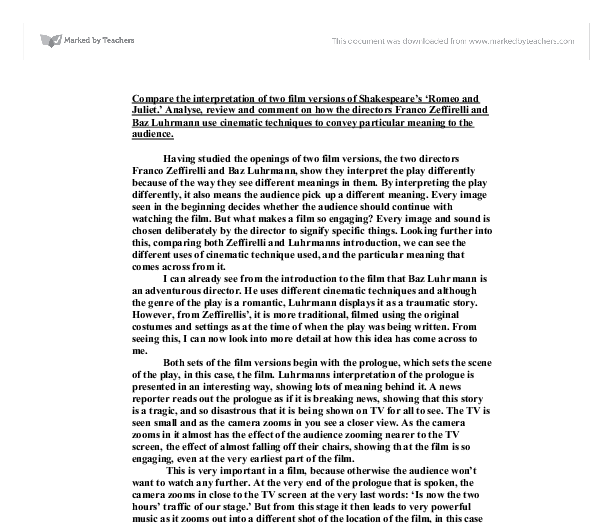 Analyse, review and comment on how the directors Franco Zeffirelli and Baz Luhrmann use cinematic techniques to convey particular meaning to the audience. Compare the interpretation of two film versions of Shakespeare's 'Romeo and Juliet.' 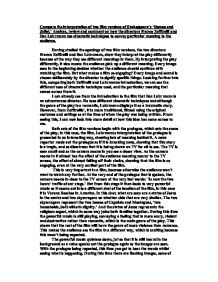 Analyse, review and comment on how the directors Franco Zeffirelli and Baz Luhrmann use cinematic techniques to convey particular meaning to the audience. Having studied the openings of two film versions, the two directors Franco Zeffirelli and Baz Luhrmann, show they interpret the play differently because of the way they see different meanings in them. By interpreting the play differently, it also means the audience pick up a different meaning. Every image seen in the beginning decides whether the audience should continue with watching the film. But what makes a film so engaging? Every image and sound is chosen deliberately by the director to signify specific things. Looking further into this, comparing both Zeffirelli and Luhrmanns introduction, we can see the different uses of cinematic technique used, and the particular meaning that comes across from it. I can already see from the introduction to the film that Baz Luhrmann is an adventurous director. He uses different cinematic techniques and although the genre of the play is a romantic, Luhrmann displays it as a traumatic story. However, from Zeffirellis', it is more traditional, filmed using the original costumes and settings as at the time of when the play was being written. From seeing this, I can now look into more detail at how this idea has come across to me. Both sets of the film versions begin with the prologue, which sets the scene of the play, in this case, the film. ...read more. The difference is seen between the two houses by the clothes that they are wearing. The Capulets are wearing dark, Mexican kind of clothes whereas the Montagues are wearing brightly coloured Hawaiian shirts, which add to their foolish personalities. This is the idea given to me when the Montagues seem a lot more scared when they enter. The lead up to the fight takes quite a while because it goes into great detail as it introduces it. When Benvolio enters again, when the fight is about to start, he seems a lot more powerful than the other Montague boys, as if he is the leader, but then again so does Tybalt when he enters very calmly, lighting a cigarette. It would look rather odd if they entered in the fighting scene with swords in a modern film, which meant that it was very clever and interesting how the director used guns, naming them swords. For example when Benvolio enters, it zooms in on the gun that he has which engraved upon it are the words '9mm gun'. When Benvolio says, 'I do but keep the peace, put up thy sword or manage to part these men away with me' it makes him seem scared, as though he does not want to fight, but to have peace. But Tybalt does want to fight when he replies how he hates the word peace. As he is saying this, I have noticed that they zoom in on the characters faces, preferably where the eyes are to show the emotion from it. ...read more. This would have taken only one shot when it was being filmed because of the way that the people destroyed the set. When the prince enters, he is the actual prince to the country, unlike in Luhrmann where he is the chief police. Because of this comparison, the prince seems much powerful and high up, as he enters in wealthy clothes and on horseback. He speaks out his lines to everyone in the market square whereas in Luhrmann it is much more enclosed as he tells it to them face to face. There aren't as many camera techniques used in the Zeffirelli version because of at the time this was made, technology wasn't as good as what it was at the time of the making of Luhrmanns film. But this has a good effect because some areas of the audience would prefer this; the older area of them would, so therefore the target audience would be more the adults. But with all the camera techniques involved in Luhrmanns very engaging film, the target audience is much more younger, (which is why I feel that the Luhrmann version was more appealing to me and was more engaging.) this is also because of the characters involved. With Leonardo Di Caprio involved, it got more of the audience members wanting to watch Luhrmanns version, therefore proving that the type of people chosen to play each character is very important. Both films have their advantages and disadvantages; they are both engaging in different ways and had different meanings that have come across from each of them. But because they are so completely different, it clearly shows how the directors' interpretation of the play was different and showed throughout the film. ...read more. When the music was played everyone stopped. You can see the realisation of hope in everyman in the confinement. Camera shots from different angles show the many expressions. In the recreation ground, we see hundreds of convicts look at the speakers, as if looking to heaven, in innocence and hope. The crowd are grateful to have them and there is a good atmosphere. Elliott deliberately shows the crowd to demonstrate the acceptance of Felicia and Mitzi. The music is happy and shows how Mitzi and Felicia feel. The main reason Felicia comes on the trip is to complete his dream to climb King's Canyon in a frock. This makes the facts interesting; because of the way it is communicated. Important part of a TIE production. > When being told, Chris stands apart from her, avoiding eye contact, looking at audience, trying to show strength in physical structure, voice betrays weakness and emotion. > You don't need to mix drinking and driving We were taught about the Stanislavaky by how he always has an objective in his lines. He always knows that there should be a particular action or the line and it should mean something important from which ever position it is seen at. Within her character she is not very confident but is naive. Looking at the good things of both films we can say that it shows a good comparison between real life and TV life although in The Truman Show it might not have been so evident. The Friar tells Juliet to take it the night before her wedding. Meanwhile, he will send a notice to Romeo to return from Mantua. When Juliet awakes from her "nap," Romeo will be there waiting for her. Juliet thinks this is a good plan and will work and Juliet takes the drug. They are wearing bright, flowery shirts. This gives the audience the impression that they are happy-go-lucky boys. We also see that the boys are confident and not very serious and, although they are have guns, they are just playing at being men.